Melt 2 tablespoons of butter in a medium size pan. Caramelize sliced banana pieces and banana halves. Transfer bananas to plate and reserve butter in pan until ready to use. In a small bowl, whisk together dry ingredients (flour, baking powder, baking soda, salt and nutmeg). In a larger bowl, add the 2 mashed and sliced caramelized banana pieces. Stir in the ½ cup softened butter, vanilla, sour cream, brown sugar, eggs, rum and combine until smooth. Add the dry ingredients, and stir to combine. 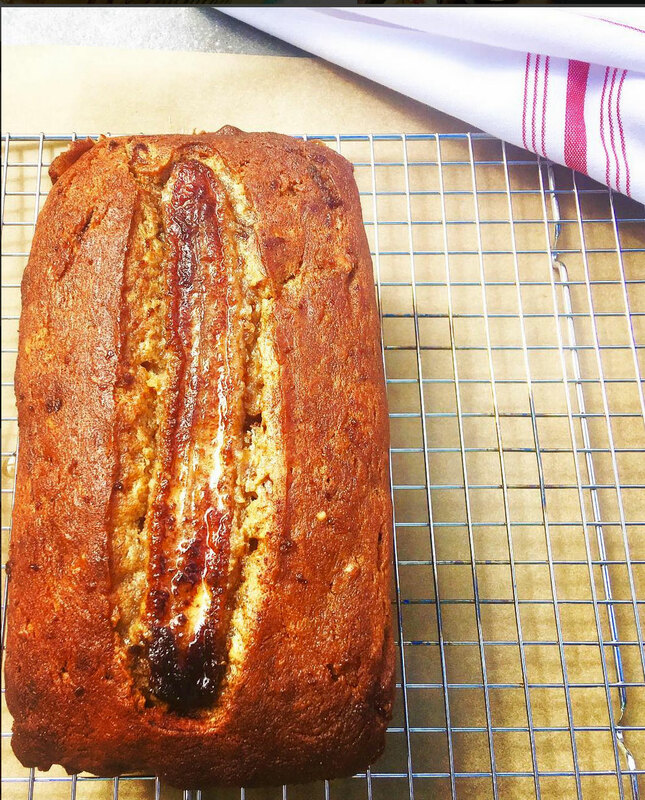 Add walnuts and pour batter into a greased bread pan and top with caramelized whole bananas. Bake approximately 50-60 minutes (depending on oven). Warm up reserved butter in pan and brush on loaf right before serving. Enjoy!